The top of an aircraft carrier is called the flight deck and looks like a very small airport. Old aircraft carriers carried airplanes that could takeoff and land in the short distance of the flight deck without help. Similarly, small modern aircraft carriers only carry helicopters or specially designed airplanes that can take off and land straight up and down or in the short distance of the flight deck. The flight deck of a large, modern aircraft carrier has a landing area and a take-off area. The landing area is in the back and has a short runway. Airplanes stop by using a hook on the back of the airplane to grab wires stretched across the runway. In the front, the flight deck has a steam-powered catapult that connects to the front wheel of an airplane. The catapult throws the airplane off the deck, helping it take off quickly. So, aircraft carriers are basically floating, mobile airports. Because they are so big, modern aircraft carriers often have on-board nuclear power plants. 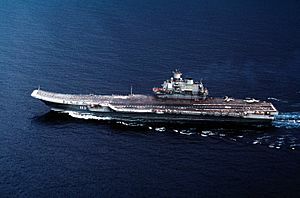 Other aircraft carriers are powered by diesel engines. US Navy personnel direct an aircraft onto a catapult aboard the Nimitz-class aircraft carrier USS John C. Stennis. Aircraft carrier Facts for Kids. Kiddle Encyclopedia.